is dedicated to providing quality vision care and eye surgical services including cataract surgery to patients in Goodyear, Avondale, Litchfield Park, Buckeye, Tolleson, Tonopah, and the surrounding Phoenix community. With state-of-the-art technology, your eye doctor and professional vision care team at Goodyear Eye Specialists accurately diagnoses a variety of eye diseases and conditions and plans a course of care for the individual patient. Our medical staff cares for you, not only your eyes, treating you how we would want to be treated. We look forward to helping you resolve your vision challenges and maintain your eye health. 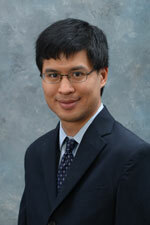 Dr. Howard Chen is a board-certified, comprehensive ophthalmologist and experienced cataract surgeon. He completed his medical degree at the University of Pennsylvania and his ophthalmology training at at Mount Sinai School of Medicine in New York City. Afterwards, he completed a fellowship in medical retina. © 2019, Goodyear Eye Specialists, Goodyear, Arizona. Medical Website Design by Medical Management Associates.